BPS has adopted a Home-Based student assignment policy to assign students to kindergarten through grade 8. All of our high schools remain citywide options for our students. The Home-Based plan uses a student’s home as the starting point. BPS will offer a customized list of school choices for every family based on their home address. 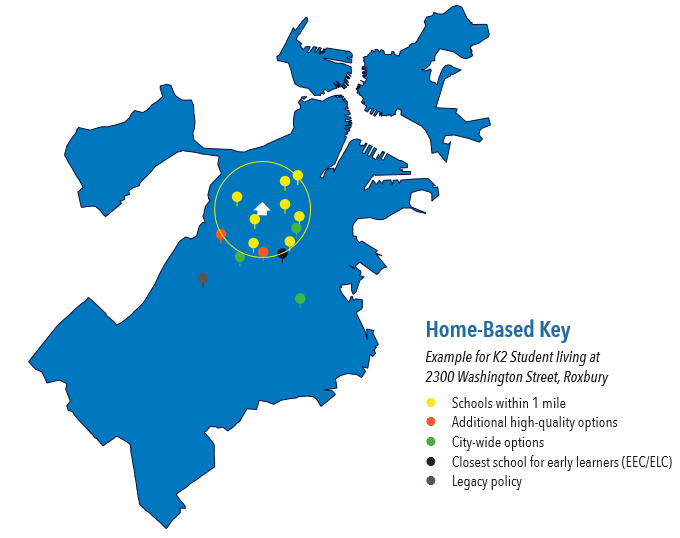 It includes every school within a one-mile radius of their home plus, as needed, nearby high-quality schools based on BPS's School Quality Framework (SQF) system of measurement. This ensures that every family has access to high-quality schools, no matter where they live. Families may also select any citywide school. And some families may have regional options, as well. Every family has a choice of at least six schools; most will have between 10 and 14 choices. Due to limited seating, we cannot guarantee an assignment to K0 or K1. Students who apply for grades K0, K1, 6, 7, and 9 in January have the best chance of assignment to their top choice schools. For students applying for grade 5, BPS will make every effort to assign to a school on the Home Based list; however, due to grandfathering, an assignment from the list cannot be guaranteed. In such instances, a student may be administratively assigned to a school within the former zone structure. The Home-Based plan creates community clusters of school options to ensure that students can enroll in schools that offer quality programs closer to home. English Language Learning students have access to schools on their home based list as well as program options in their wider cluster. Depending on their needs, students with disabilities may be able to choose seats from the home-based list, or they may be assigned to a program within the cluster in which they reside if their Individualized Education Program calls for specific services or level of services.